Nitin Natarajan directs Cadmus’ support for public health and healthcare projects in the homeland security sector, helping organizations at all levels of government, nongovernmental organizations, nonprofits, and private sector organizations improve health security and preparedness in the face of complex and evolving challenges. His unique background allows him to provide practical, operational, and strategic guidance to tactical staff on the ground as well as policy makers in the most senior levels of government. Mr. Natarajan has more than 20 years of experience leading homeland security, emergency response, public health, healthcare, and environmental initiatives at the local, state, and federal levels. His professional career includes service as deputy assistant administrator for the U.S. Environmental Protection Agency’s (EPA’s) Office of Land and Emergency Management; as director of critical infrastructure policy on the National Security Council; and as the leader of the U.S. Department of Health and Human Services’ Critical Infrastructure Protection, Continuity of Operations, and Response Logistics Programs. He began his career as a first responder for 13 years, including service as a flight paramedic. 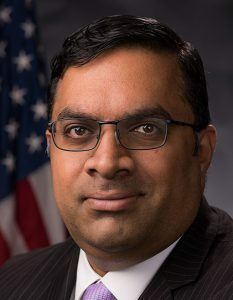 Nitin Natarajan holds a bachelor’s degree from the State University of New York and a master’s degree from the United States Naval Postgraduate School, and graduated from the Executive Education Program at Harvard University’s National Preparedness Leadership Initiative. MG John B. Morrison, Jr.
© 2017 Augusta University and the Georgia Chamber of Commerce.